I’ve been around horses in some capacity for a large part of my life. I’ve written about them in various forms and my 3 year old seems to have an uncanny attraction to them. I grew up in New Jersey and spent several weekends each spring and summer at Monmouth Park, a horse racing facility for thoroughbred horses located on the Jersey Shore. Monmouth Park was and still is one of my favorite places to visit and horse racing is one of my favorite recreational hobbies.It also holds a special place in my heart because it was one of the last memories I had with my grandfather before he passed. As a child, my dad and grandfather would take me on the weekends during the racing season. Finally, the day came when I would take my grandfather to the track one final time. His kidneys had failed and he was frustrated with the dialysis treatments that he been on for almost two years. I saw that he was having more bad days than good days and noticed how often he grew confused and weak by the end of each day. After speaking to my grandmother, I got permission to take him out for one last hurrah to bet on horses and drink some beer with his grandson (she didn’t know about that part, but that what he wanted). In his typical fashion, he turned $10 into $350 after 6 races. Below is a really a short guide on horse racing and betting that is based on my experiences. Don’t forget the golden rule of gambling: Never bet more than you can afford to LOSE. Remember his is only a guide, and is for entertainment purposes only. A day at the races is a family friendly affair and betting on horses is only a small part of the experience. With a cooler full of food,snacks, and a comfortable viewing area, you can have fun filled day for less than $50 dollars.Most tracks also allow you to bring your own beer as well! Pari-mutuel wagering (a type of gambling designed for horse races) is the most common form of betting for horse racing and throughout the entire world. This means simply that every dollar that is bet is combined and put into a common pool. In other words you are not actually wagering against the track. You are in essence betting against your fellow gamblers at the racetrack. The money all gets combined and put into a pool. The track simply takes a cut of this money, a percentage if you will, off the top. Then the remaining dollars are calculated into winning payoffs and redistributed at the end of the race to the winning ticket holders. In Horse betting, odds are determined by the bettors, so they can change right up until the betting stops, similar to how the price of a stock can fluctuate from minute to minute. As people bet more on a particular horse, then the odds will drop. You find out the odds by looking at the tote board. The tote board is the big board out in front of the main part of the track. It has large numbers at the top 1,2,3,4,5,6,7,8,9,10,etc. these denote the horse numbers in the race. Below the number for each horse you will see lighted numbers that are the odds. These numbers should be changing if you watch them right up until the post time (the start time) for the race. If you find #5 on the board and it says 6-1 underneath, then this means that you will win approximately $6 for each dollar that you bet to win. Recall that payoffs are figured in $2 amounts, so if you bet $2 to win on the #5 horse and he went off at 6-1 odds, you win $6 for each $1 that you bet. With that bet, you would win around $12 in total, plus get your original $2 wager back. This is why a 6-1 horse pays around $14 to win. Walking up in person or to a machine to make a bet for the first time can be intimidating to the novice. The people taking the bets aren’t that nice and horribly impatient, the people behind you will yell at you to to hurry up if you are taking too long, and the machines used to take in the bets have anywhere from 10-50 buttons which makes slightly easier to figure out than the Rosetta Stone. In short, you need to state what you are betting on by making a selection, the type of bet, and the amount you are wagering. Your selection will obviously depend on the odds offered, so you will want to examine the range of odds available before you make a decision. The most common and simplest types of bets you can place are Win, Place and Show bets. Keep this simple rule in mind, all bets at the track are figured in $2 denominations. This means simply that all wagers are calculated for the standard $2 minimum bet. Why? that’s simply the way it’s been done 200 years ago and they continue to calculate them that way today. Straight bet or Single or Win bet. This is the simplest and most common bet. You bet on a winner at given odds. You collect only if your chosen horse is the first across the finish line. Place. 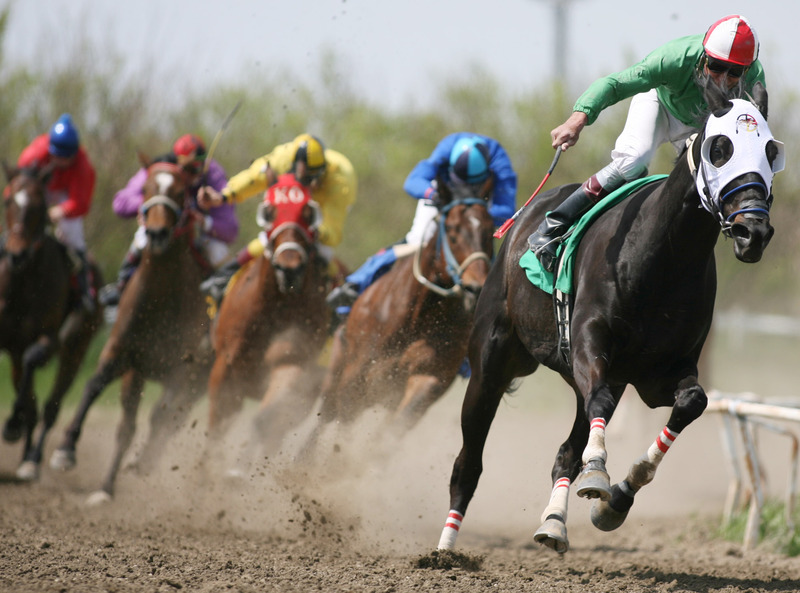 A wager for place means you collect if your selected horse finishes either first or second. Show. The third horse across the finish line. A wager to show means you collect if your selected horse finishes either first, second or third. Here’s a sample of what to say: “ For Race 3, can I have $2 on 3 to WIN and a $2 on 7 to SHOW?” Your total bet for this would be four dollars and depending on the odds of the race, you could walk away with anywhere from 10 dollars to $50+ if your horses win and show. These are the bigger money bets. A two dollar bet could clear $1000 or more! Pick 3. This wager requires the player to pick the winners of three consecutive races. Some race tracks have a rolling pick 3 which is when the player must pick three races in a row and it continues for the next three races..
A bet placed on two horses but they must cross the finish line in exact chosen order. A bet placed on three horses to cross the finish line in exact chosen order. A bet placed on four horses to cross the finish line in exact chosen order. Put the Odds in Your Favor Read up on your horse and track before you go to the track. Many local newspapers have information and odds on the horses that will be running that day or week. Research the stable the horse comes from, owners, trainers, and jockeys to get a better feel of the horses you will be betting on. Knowledge is Power. Buy the Program When you walk into the entrance gates towards the grandstands, you will find someone who is selling programs for anywhere from $3-$5. Buy one! It has a lot of great information (including projected winners for each race) and can help you make educated guesses on some of the big money trifecta bets. Take a close look at the comments for each horse. Even though it should be an impartial evaluation of the horses, it is not. Every writer has their own angle and is never %100 impartial. If you can decipher the writers angle, you are putting the odds in your favor. Have Fun! This needs to be fun for you and your family. Let the kids walk up to see the horses, enjoy the sunshine, and when your horse comes around the turn, make sure everyone yells for you their horse to win! There are certainly some unsavory sides to horse racing, but if you can focus on the experience and enjoyment your family will have, it’s always a solid bet. Good Luck!